Foot & Ankle Center joining our group. Dr. Robert Hatcher began the practice in 1977 as a solo practitioner. In 1999, Dr. Kirk Woelffer joined the practice. 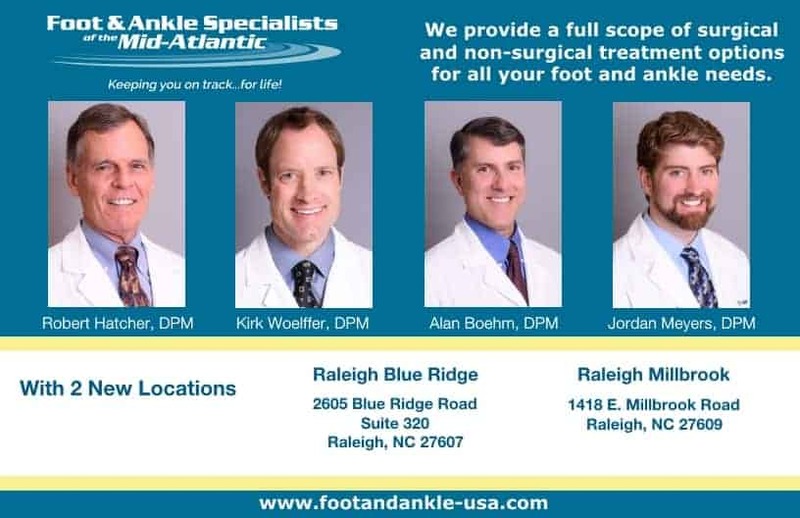 Later in 2006, Dr. Alan Boehm, Jr. was added and then Dr. Jordan Meyers ", "articleBody": "
FASMA welcomes two new office locations and four new podiatric doctors in January with Raleigh Foot & Ankle Center joining our group. Dr. Robert Hatcher began the practice in 1977 as a solo practitioner. In 1999, Dr. Kirk Woelffer joined the practice. Later in 2006, Dr. Alan Boehm, Jr. was added and then Dr. Jordan Meyers in 2014. The office location was moved in 1994 to the current location on Millbrook Road and a second location on Blue Ridge Road was added in 2015. Drs. Robert Hatcher, Kirk Woelffer, Alan Boehm, Jr, and Jordan Meyers are FASMA’s four newest podiatrists. Drs. Hatcher, Boehm, and Meyers are graduates of the Temple University School of Podiatric Medicine and Dr. Woelffer obtained his degree from Des Moines University. Dr. Hatcher completed his surgical residency at Northlake Hospital in Chicago. Dr. Woelffer completed his surgical training at Deaconess Hospital in St. Louis under the guidance of Dr. Allen Jacobs. Dr. Boehm was a resident at Temple University Hospital. Dr. Meyers finished his surgical training in Podiatric Medicine and Surgery at the University of Louisville Hospital and Kentucky One Health. With the newest Raleigh division, FASMA now has 54 podiatrists and 34 office locations.